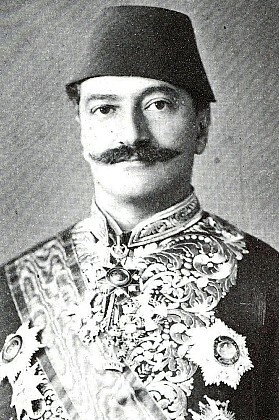 Sarkis Bey is the son of Garabed Amira Balyan and the brother of Nigoğos, Agop and Simon. He was educated privately until the age of 12, then went to Paris to complete his study in 1843. After studying there for 2 years, he returned to Istanbul to work with his father. In 1848 he went back to Paris and continued his study at the Department of Architecture of the College of Saint Barbe. He proceeded to take advanced courses on engineering at the Ecole Centrale and the Academy of Fine Arts, and completed his study in 1855. Sarkis Bey then returned to Istanbul and worked with father and his brother Nigoğos. His first independent project was a marble pool at Beş Çınar in Salonika, where he went with Sultan Abdülmecid. He built the pool in a single night and the Sultan received the local dignitaries on its edge in 1859. Both his revolving steam machine and inexplosive fascicular boiler received awards at the International Industrial Exhibition in London. They were widely used in the European countries and his British patent was issued on 19 March 1862. In 1864, Sarkis was given the title of Bey. He was appointed as imperial architect at the age of 35 with his brother Agop Bey, when their father died in 1866. Sarkis Bey was awarded the rank of Ula Evveli and promoted to the rank of Bala. He was also awarded a decoration by the King of Bavaria on 1 August 1872, the Cron de Ferre second class by the Austrian Emperor on 20 October 1872, the Prussian Cross by the German Emperor Kaiser Wilhelm II on 15 January 1873 and the St. Stanislavos medal by the Russian Czar Alexander II in 1873. Sarkis Bey was given permission to found a company called the Şirket-i Nafia-î Osmanî on 21 March 1873 and the company went into operation on 1 July of the same year, with a forty-eight article memorandum of association drawn up by him. Soon after the establishment of the company, Sarkis Bey was given a 35 year monopoly to build a railway in some districts, and sole rights over coal mines in the districts of Bartın and Çide in the province of Kastamonu. Sarkis Bey cooperated with several banks in Istanbul for railway construction and built up a capital of one million Ottoman gold liras. The buildings constructed by the Balyans emerged unscathed from the several earthquakes of 1874. Sultan Abdülaziz (r: 1861-1876) was so impressed that he presented Sarkis Bey with the second class Osmanî decoration in 1874 and the first class Mecidî decoration on 4 January 1875. In 1874, Sarkis Bey was also awarded the Şir-i Hurşid decoration by Shah Nasrüddin of Iran. In 1873-74, he purchased 40,000 m2 of land in Beykoz planning to open a steam powered sawmill, and obtained sole rights for the mining, transportation and marketing of coal in Ereğli. Sultan Abdülhamid II, in appreciation of the Balyan family’s contribution to Ottoman architecture and Sarkis Bey’s architectural skills, gave him the title of Ser Mimar-ı Devlet (Chief Architect of the State) on 31 March 1878. He also received the Nişan-ı İmtiyaz decoration and Liyakat medal from Sultan Abdülhamid II. 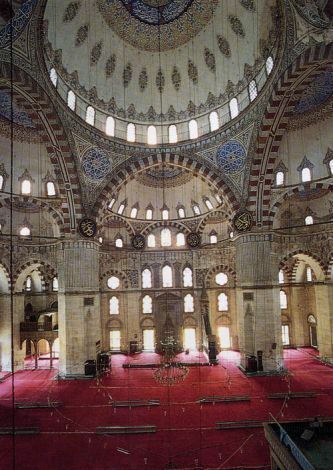 Sarkis Bey was not only a successful architect and engineer, but also painter and musician. He composed a song named “Mayr Christopher Columbus”. He was also a patron of arts and education, who provided financial assistance to talented artist. Sarkis Bey was a friend of the famous Russian painter Ivan Konstantinovich Ayvazovsky. Ayvazovsky came to Istanbul in 1874 and Sarkis Bey received him at both his house in Beyoğlu and his islet off Kuruçeşme for two months. He introduced Ayvazovsky to Sultan Abdülaziz, who commissioned a number of paintings for Dolmabahçe Palace. In 1874, Ayvazovsky was given audience by Sultan Abdülaziz and presented with a second class Osmanî decoration. While Ayvazovsky stayed in Istanbul, several young artists visited him at Sarkis Bey’s house in Beyoğlu to listen his views on art. Sarkis bey was married to Makruhi Hanım, the daughter of Chief Gunpowder Marker Arakel-Sisak Dadian Bey. After his wife died in 1863, Sarkis Bey built the Makruhian School in Beşiktaş in his wife’s name in 1866. He also built the Arshaguniats Armenian School in Dolapdere in 1875, and a school in Van. He also provided these schools with financial assistance for many years. The projects Sarkis and his brothers undertook include six palaces, fifteen mansions and pavilions, two hunting lodges, three mosques, four barracks, two ministries, two schools, a monumental fountain, a factory and a warehouse, as well as private houses, a clock tower and other minor projects. Çırağan Palace, Beylerbeyi Palace, the Büyük Mabeyn Pavilion and similar buildings are major monuments of the period. Throughout his life, Sarkis Bey made beneficial contribution to his country and Ottoman society. He died at the age of 68 on his tiny island at Kuruçeşme, and was buried with a funeral worthy of his standing in the family tomb.